Hey everyone! 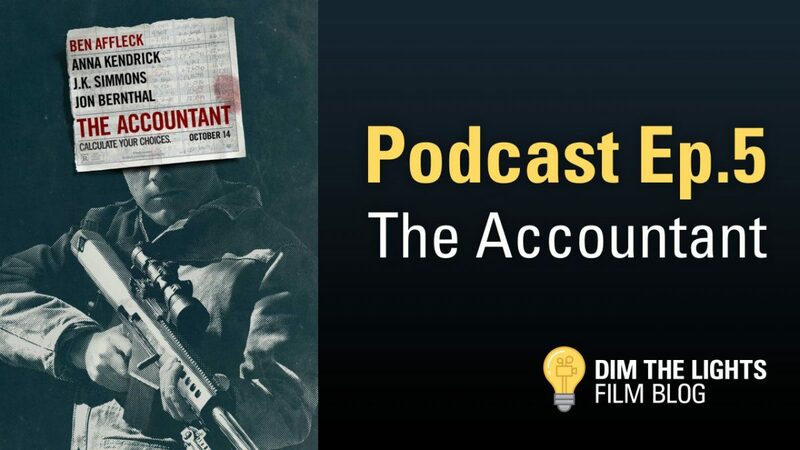 This week we discuss The Accountant, a film by Gavin O’Connor and starring Ben Affleck, Anna Kendrick and J.K. Simmons. Late Friday night, we were pleasantly surprised by The Accountant, which is not the film it is promoted to be. Rather than your typical action film, The Accountant offers much more that films like Jason Bourne were lacking. Screen Crush reports Ewan McGregor’s interest in reviving his Star Wars character, Obi-Wan Kenobi in not 1, but 2 feature films. You can read more about Ewan’s interview here. Not sure how I feel about this cliche comparison, but here’s to hoping Jurassic World 2 can top the first one. Here is the full article on Screen Crush. Anna Kendrick to play Robin? Anna Kendrick could pull off Robin, but what about Batgirl? I think that works better. See her in the full getup. If you enjoyed this episode, please feel free to leave us a review on iTunes. If you want to go the extra mile, you can support us at our Dim The Lights Patreon. In an effort to give you awesome content, we recently partnered up with Lootcrate. Definitely check out their exclusive subscription service by clicking this link. Every purchase will help keep our website going, so we appreciate all the help and support.